†With credit approval for qualifying purchases made on the Toro Credit Card at participating dealers. As of December 26, 2018, Purchase APR: Variable 25.99%. Minimum interest charge $2.00. Minimum interest charge $2.00. See card agreement for details. Offer valid for accounts in good standing; is subject to change without notice; see dealer for details. May not be combined with any other credit promotion offer. 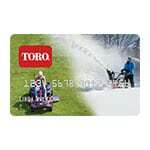 How to Get Cash Back on Your Toro Snowblower - View Our Toro Snowblower Credit Card Rebate Offer. Our snowblower how-to library can help you pick the perfect single-stage snowblower, two-stage snowblower or snow blower accessory.